Acupressure therapy, sometimes called pressure acupuncture, has been used in traditional Chinese medicine for thousands of years. It involves applying pressure to acupressure points that lie along meridians in your body to promote relaxation and treat illnesses. There are more than 400 acupressure points on the body. It is believed that vital energy called qi (chi) flows through these meridians or energy pathways. There are 12 major meridians that connect specific organs, thus organizing a system of communication throughout the body. Illness occurs when one or more of these meridians are blocked or out of balance. Most Western practitioners, however, attribute the benefits of acupressure to factors like reduced muscle tension, improved circulation and stimulation of brain chemicals called endorphins that act as natural pain relievers. Irrespective of the underlying reason for its effectiveness, several studies have found this alternative therapy beneficial for relieving certain aches and pains. The acupressure points are to be pressed with moderate pressure for a few seconds up to a couple of minutes and then released. For best results, take slow, deep breaths as you hold the acupressure points. 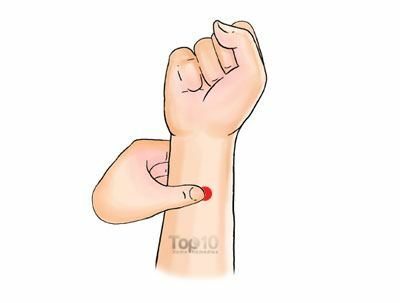 Here are the top 10 acupressure points for relieving pains and other problems. 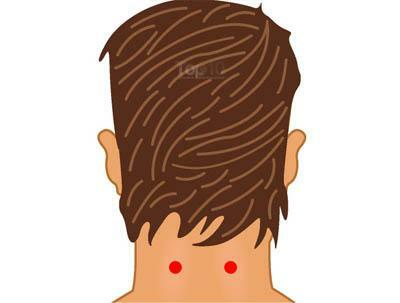 The Joining the Valley (LI 4) acupressure point is popular for getting rid of headaches. It also helps relieve toothaches, neck pain, shoulder pain, arthritis, constipation and hangovers. This point is located in the fleshy area between the thumb and index finger, at the highest spot of the muscle when both the thumb and finger are brought close together. Press and massage this point for a couple of minutes and then repeat on the other hand. Do this as needed. 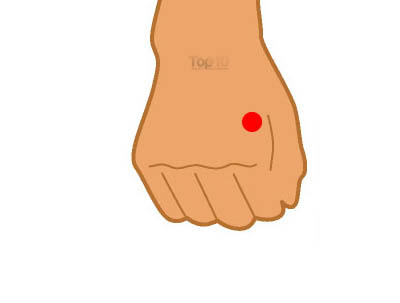 Note: Do not press this acupressure point during pregnancy. 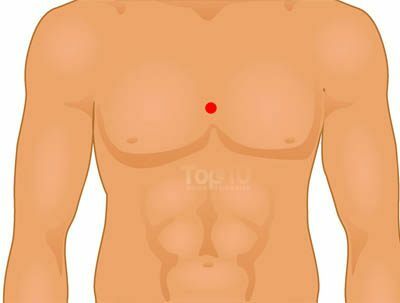 The Pericardium (P6) acupressure point is considered useful for getting rid of nausea and vomiting caused by a variety of reasons including motion sickness, pregnancy, post-surgery and post-chemotherapy. It also relieves upset stomach, headaches, chest pain, and carpal tunnel syndrome pain and discomfort. It is located between the two large tendons on the inside of your wrist, about three finger-widths below the base of your palm. Press the point with your index and middle fingers for a couple of minutes. Repeat several times, as needed. You can also get acupressure wristbands from a drug or health food store and use them. The Third Eye acupressure point (GV 24.5) is good for calming your mind, improving memory, relieving stress, chronic fatigue, headaches, eye strain and insomnia. It also helps relieve sinus pain and congestion. 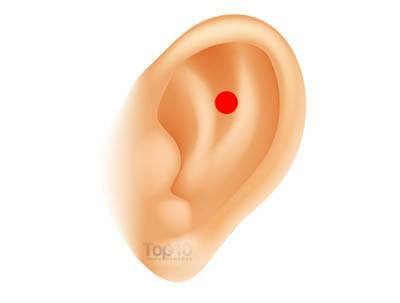 This point is considered beneficial for spiritual and emotional imbalances as well. 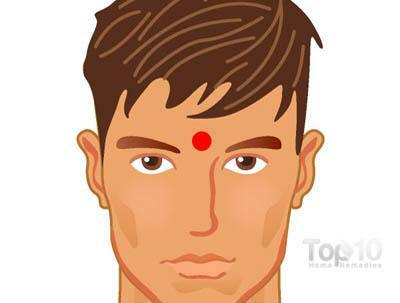 Close your eyes and locate the Third Eye pressure point on the knobby spot on the bridge of your nose between your eyebrows. Using your middle finger, gently press it for a few seconds to 1 minute and then release. Repeat several times a week. Also known as Conception Vessel 17 (CV 17), the Sea of Tranquility acupressure point helps restore a sense of calm and relieves anxiety, nervousness, depression, hysteria and other emotional imbalances. It also helps boost the immune system. It can be easily located on the center of the breastbone, about four finger-widths up from the base of the bone. You can press this point when you are in the prayer position with your palms joined, fingers pointing upward, and the knuckles of the thumb pressing into the breastbone. Make sure your spine is straight, preferably supported by a straight-back chair. Press it for a couple of minutes daily while taking slow, deep breaths. Continue for a few months. 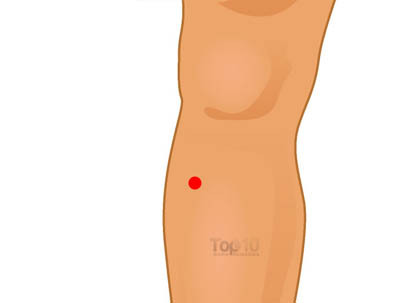 The Leg Three Miles (ST 36) acupressure point is commonly used to improve digestive disorders including indigestion, diarrhea, constipation, bloating, gas, abdominal pain, nausea and vomiting. 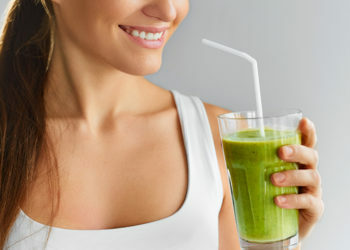 Plus, it boosts the immune system, fights fatigue, strengthens the body and promotes general wellness. Bend your leg and place your fingers just below the knee cap, beginning with the index finger at the base of the knee cap. You will find the Leg Three Miles point at four finger-widths down from the base of the knee cap, where your little finger rests just to the outside of the shin bone. Apply moderate to deep pressure on this point for a few seconds daily. You can press this point on both legs at the same time. This knee back acupressure point (B 54) is beneficial for reducing knee and back pain; stiffness in the back; arthritis in the knee, back and hips; and sciatica pain. A study published online by the British Medical Journal in 2006 noted that acupressure may be more effective than physical therapy for relieving low back pain. The researchers also found that the effects of the therapy were not short term because, in fact, they lasted for six months. 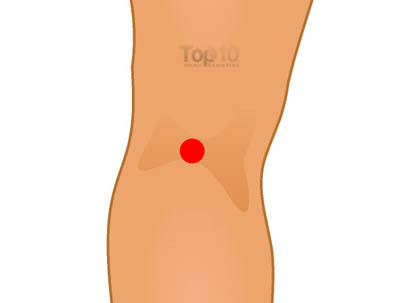 Commanding Middle acupressure point is situated at the center of the backside of the knee cap. Gently press it for about 1 minute and then repeat on the other leg. Do this daily, as needed. Sacral acupressure points are great for relaxing the uterus and relieving menstrual cramps. It also helps reduce sciatica and lower back pain. The bunch of sacral points is located on the sacrum, that is, the base of the spine directly above the tail bone. Simply lie down on your back with your hands under the base of your spine. Place one hand on top of the other so as to apply steady and firm pressure on the sacral points for a couple of minutes. Acupressure and acupuncture can also help in getting rid of an addiction. An auricular point called Shen Men can make it easier for you to quit smoking, especially when used in conjunction with other points. Plus, it helps relieve stress, anxiety, depression, insomnia and inflammatory diseases. It is similar to the heart meridian point HT 7 but has a wider range of therapeutic benefits. It is believed that ear acupuncture helps you quit smoking by making the taste of cigarettes less desirable. It is advisable to use acupressure and acupuncture as an adjunct to your substance abuse treatment plan. The Shen Menpoint is located on the upper half of the ear, above the apex of the triangular fossa. Place your index finger on this point and your thumb behind the ear on the same point. Massage it by applying firm pressure. Do this a few times daily until you are satisfied with the results. Use it in conjunction with other points like Tim Mee, Broken Sequence, Sympathetic Autonomic Point and others. For best results, it is recommended to have the treatment done by a qualified professional. Heavenly Pillar (B 10) is a pair of acupressure points that are excellent for reducing stress, anxiety, exhaustion, burnout, headache or heaviness in the head, neck pain and insomnia. They are also good for relieving eye strain and a stiff neck. These points are located at one finger-width below the base of the skull on each side, on the prominent neck muscles located 1/2 inch out from the spine. Just press these acupressure points for a couple of minutes daily for several weeks. Bigger Rushing (LV 3) acupressure point is good for improving memory and concentration. It encourages clarity of thought and focus. Also, it helps relieve headaches, soothe tired eyes, fight fatigue, reduce hangovers, boost the immune system and prevent allergies as it keeps the body’s energy flowing smoothly. You can easily locate this point on the top of the foot, where the bones of the big toe and second toe meet. Press it gently for a couple of minutes and then release. Do this 2 or 3 times a day for a few weeks. Warning: Although acupressure is generally considered safe, pregnant women should consult an expert before applying this therapy as some acupoints may stimulate uterine contractions. Plus, those suffering from arthritis, heart disease, cancer and other chronic conditions should consult their doctors before trying this or any other therapy involving muscles and joints. Avoid applying pressure on acupoints on an empty or full stomach. Do not apply acupressure on areas with broken skin or healing skin. yes it is true since ten years am making use it for my health. one should have a faith and practice it. helpful in life, we thank u!!! Thank you very much for such vital information..I am allergic to a lot of pain killers and shall try these techniques to heal the pain. application with much more ease. enjoys a quantum leap stress-free. i like aqupressure therapy. wish to learn more about the theraphy.pl.send me matrial,guide book, books name. Cereberall is in the back part of the brain that is dameged. thanks.pl share if more information available. yes, it ‘s true .very good points .it workes very well.